In India, where much of the population is below the poverty line, children are often the first victims of the evils associated with the situation. Drugs, alcohol and crime call to them like the Sirens of Odyssey. ‘Music is the language of the spirit. It opens the secret of life bringing peace, abolishing strife’ said Kahlil Gibran. 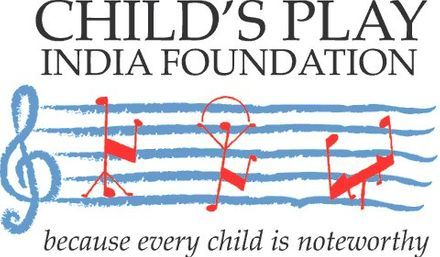 This is the motivation behind using music as a medium of alleviating the misery of slum and street children through the initiative of Child’s Play (India) Foundation (CPIF), a non-profit organisation based in Goa. The story of its formation begins with a childhood experience, as Child’s Play (India) Foundation’s director, Dr Luis Francisco Dias, tells us. Dr Dias is keenly aware that Goa is much better off than most Indian states. However, it still has its share of the abjectly poor. He says, ‘I must have been around six or seven and there was this chaiwala next to the house. I had gone down to get something when I saw a beggar pointing to the display window with buns. He was crying and asking for something to eat. The owner of the shop was very rude and physically pushed him away. That made a deep impact on me.’ The realisation that money could determine the survival of a person dawned on the young Dr Dias. He was assured of his own wellbeing under the care of his parents, but without the money he could very well have been that man. A man greatly enamoured of music, Dr Dias desired to become a musician. The paucity of opportunities for a professional musician, which is yet a problem in Goa today, proved to be a huge impediment. He opted for medicine and in imitation of his mother became a gynaecologist. In the course of delivering babies, at times, he would hold the baby in his hands and remembering Louis Armstrong’s 'It’s a Wonderful World', would think to himself, ‘This child will know more than I’ll ever know.’ It was the untapped capabilities of the child that inspired his imagination. ‘This child could have the potential to solve world hunger, achieve world peace – you never know what that baby could do!’ says Dr Dias. He felt it was unfair that this potential could be stunted by the fiscal limitations of his or her caretakers. While he was studying and practicing medicine in England, Dr Dias became involved in the music scene there and played the violin and viola in amateur orchestras. However, the connection between music and social activism was not made until January of 2007. ‘I was having a monologue with my wife, where I talk and she just listens,’ he jokes, ‘and I commented on how few orchestras there are in India. There is only one, in Bombay (Mumbai), the Symphony Orchestra of India. It is a professional one with very high class musicians…’ There is a startling disparity in the proportion of orchestras to the land mass and population of India. China has hundreds and several countries of Europe, which could very well fit into India, do too. He mused about the many children of the slums and streets who were idling away their time. ‘ “If they could be taught music”, I said, “We too could have orchestras. That would be our solution”,’ recalls Dr Dias. During the time of Proms, a music festival in England that hosts celebrated orchestras from all over the world, he found on perusing the brochure, there were two orchestras that comprised of street children. One was from Venezuela and the other from South Africa. The performances were outstanding. At the live performance attended by Dr Dias, he found these youngsters, ranging from the age of ten to sixteen, could match their skills with the English Baroque Soloists playing alongside them. On speaking to the boys later, one of them, called Samson, told him that music had saved his life. ‘…had he not been given that violin, he would have had a gun or knife or been injecting himself, and he would have been dead. This is music really touching lives!’ says Dr Dias. Dr Dias decided this was a good way of changing lives and came across El Sistema in South America, founded by José Antonio Abreu, musician and activist in 1975. Its musicians teach music to street kids to inculcate values in them, build up self-esteem and set the stage for a future for them in professional music. After that, one thing just led to another and he began contacting his network of professional musicians about the plan formed in his mind. Soon he found himself being introduced to a man, David Juritz, who was starting an organisation to help set up charities. He decided to develop Child’s Play (India) Foundation along the lines of El Sistema, and indeed, CPIF is the Indian chapter of the Venezuelan movement. He and his wife came back to Goa and began scouring the place for an ideal location and started the NGO’s first project, a partnership with Hamara School in Panaji. The musical instruments for the children have come in through appeals made to the public. Posters were put up and announcements made after Sunday Mass. Even now, it is usually donations that help out where the instruments are concerned. But it is not spending money on buying instruments that takes up most of the monetary resources. It is the teachers’ salaries because they are paid the standard rate of Rs 300 per hour. In a month, depending on sessions, Rs 50,000 could be spent exclusively on salaries. They have volunteers coming from abroad to teach the children and gain new experiences. Last year a volunteer called Anya Hirdaramani began a cello project, relieving Dr Dias of his hesitation to teach the children an instrument that is difficult to play and has a limited repertoire, and is therefore not usually chosen. Then Lukas Hartmann (cello) and Friedrich Walzel (recorder) came along through the International Foundation in Germany that has entered into an agreement with CPIF to send musicians to them. Claire Raybould from England has helped immensely with the Suzuki violin project. There have been others who have gone out of their way to promote this work, even rescheduling their own itinerary to play at a concert. Nineteen-year-old Lukas Hartmann says, ‘It is a nice experience teaching here. It is a little difficult sometimes because there are boys that are not much younger than I am and they tend to undermine my authority,’ says Lukas quite candidly. There is also a chamber ensemble consisting of CPIF children and local musicians called Camerata Child’s Play and they have performed concerts to great success. The number of students tends to fluctuate depending on the response to the programme. Occasionally students have a change of instruments or some even drop out because of domestic issues. For some students music is a panacea, but there are those who are emotionally and mentally fragile and cannot cope with what they may deem as extra pressure. There are a little over eighty children right now learning different instruments and there are plans to form a choir, which will take the number up to a hundred and twenty. The students come from three different economic strata, the most poverty-stricken being the ones at Hamara School. There are children from Goa but most of children’s parents come from Karnataka and Maharashtra. The parents work as bricklayers and labourers but some parental involvement from these quarters has begun to emerge. The Municipal Trust, which has students from Mapusa, has students as impoverished as those at Hamara School. Auxilium, Caranzalem has students coming from a slightly higher economic background even so they are still not capable of paying for music lessons. Then there is Auxilium at Aldona, which has students in a comparatively better situation than the others. ‘First they were totally nonplussed by what was happening…,’ says Dr Dias of the parents. This is because the average Indian parent looks on music training as a hobby or entertainment not as a tool for character building. Nevertheless, after seeing their children perform to applause on stage, they have become more participative. Dr Dias would like to go into the slums and having his musicians play for the people there and destroy all notions of Western classical music being elitist. This would invite more children into their fold. He finds the two main constraints he faces are obtaining funds and finding proficient teachers. With an optimistic outlook, he expects people to become more generous in time, especially with the CSR (Corporate Social Responsibility) scheme. The solution to the other problem, he believes, is importing world class music teachers for a short time, till the dearth of able teachers is no longer a problem. The cost of employing such a teacher is much too enormous and so he says, ‘If there is a benefactor who strongly believes in music as something worth supporting then we are in business. I sometimes get disheartened but I also feel that all it takes is one Ambani to wake up in the morning and say, “I’d like to support this!”,’ he laughs.